The Aussie has gone under the radar a little bit recently and in fact, it was just about the worst performer last week on not much news at all. I suspect that markets are finally changing their tune on the Aussie and it’s clear that as the US raise rates, the AUD is still going to be lagging. With that in mind, I’m still firmly bearish on the AUD. I was bearish at 81 cents and I’m still bearish now. I am looking for a move to at least 75 cents before I start reassessing. 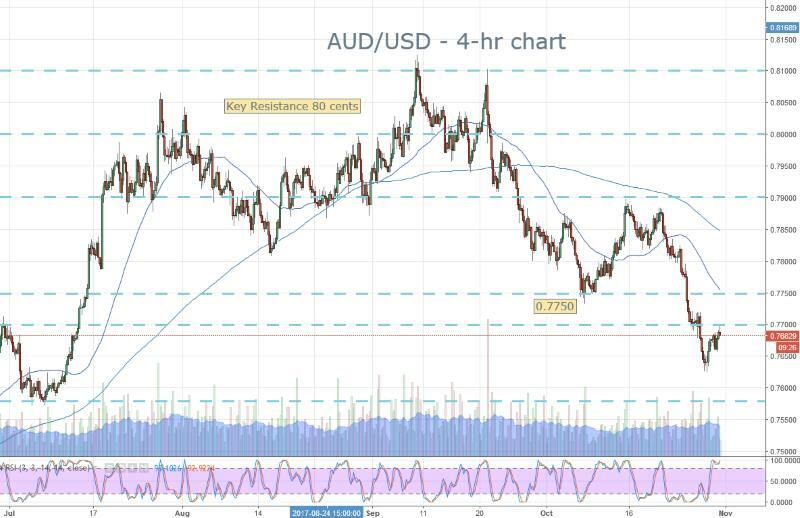 At the moment I’m watching 0.7700 as a key resistance level, that we can use to short the AUD/USD. We have tested it earlier and I will continue to use that as my main focus this session. My first downside target is 0.7578. And don’t forget we have the FOMC this week doing their thing so that will certainly impact the USD, either good or bad.